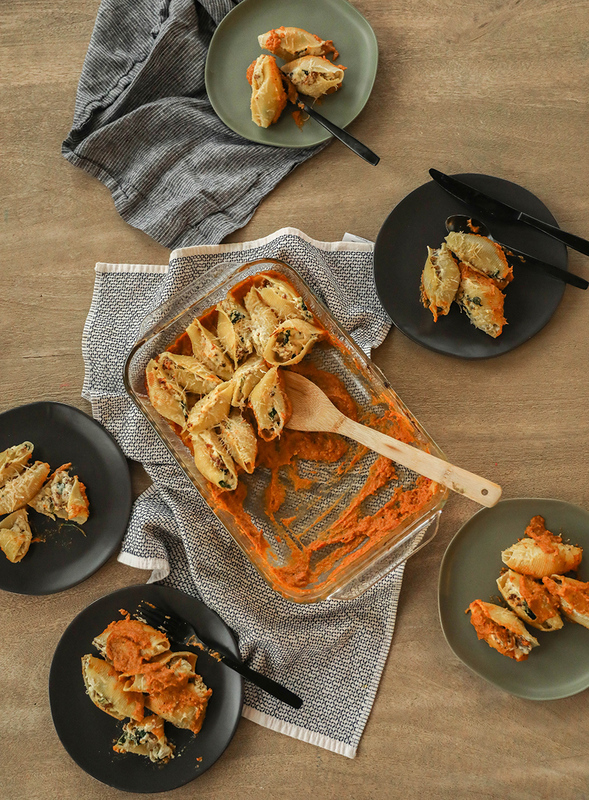 This Stuffed Shells with Roasted Butternut and Red Pepper Sauce recipe is a really good one for November when you are looking for some healthier comfort food options! We actually made this dish for a Friendsgiving dinner we hosted! 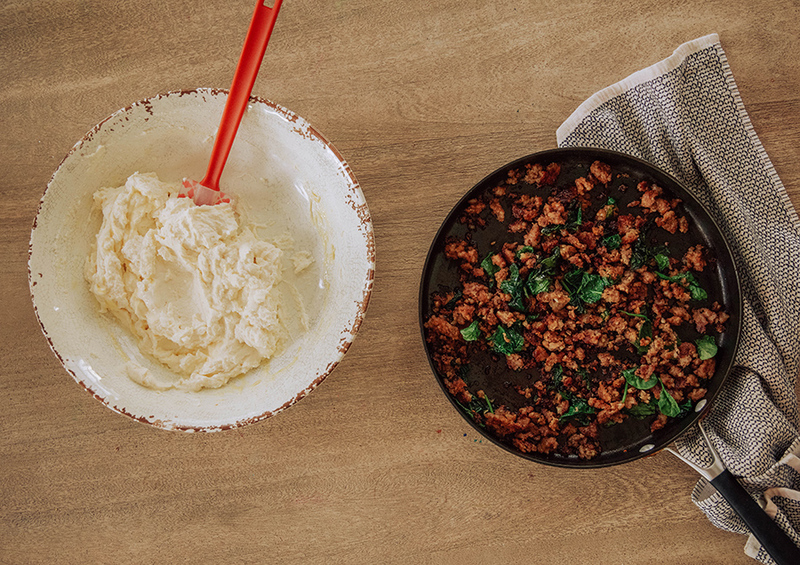 Contrary to baking, cooking has a little wiggle room to experiment with ingredients. 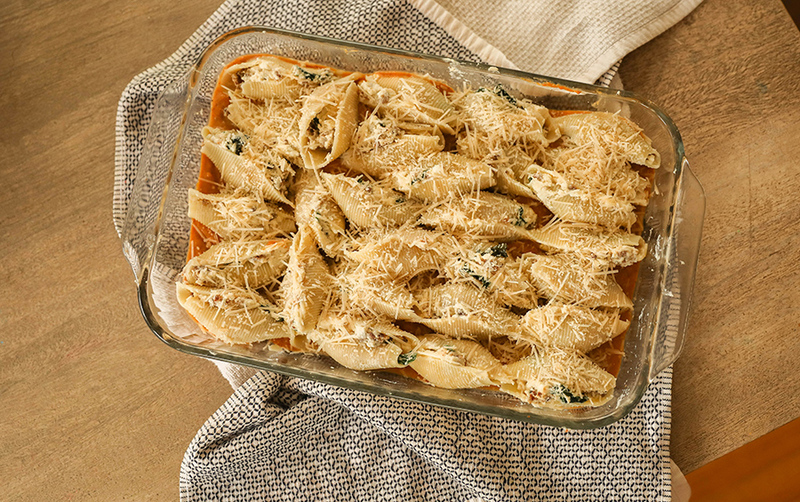 Instead of the standard pasta sauce and shells, this is a recipe that can use up those seasonal vegetables you have on hand. We had an abundance of red peppers from our garden this year! I found these fantastic pre-chopped butternut squash packs at Trader Joe’s (also found them at Kroger). Where would I be without the pre-chopped butternut squash? Probably still chopping a squash. Read on for full recipe! Boil and cook your shells as you chop your vegetables. Chop your peppers and onions and scatter across baking sheet along with the pre-chopped butternut squash. Pour over olive oil. Sprinkle salt and pepper. Use a wooden spoon to push around and flip to make sure it coats evenly. Stick in the oven for 45 min. I forgot to snap a picture of the roasted vegetables! While the vegetables are cooking, sauté the sausage over medium heat. When sausage is almost cooked through, add garlic and sauté a few more minutes. Add in spinach and stir until it spinach is wilted. Turn off heat. 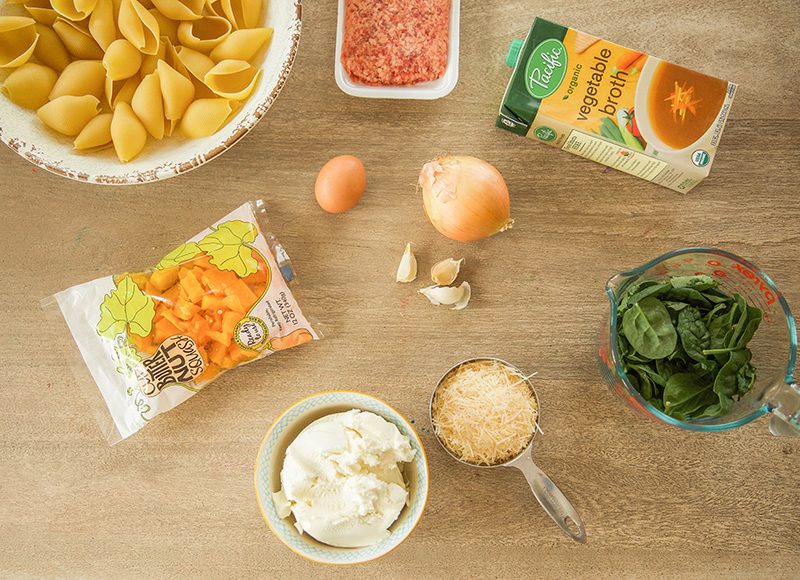 In a separate bowl, mix together ricotta, parmesan, and egg. Add sausage and spinach into ricotta and stir until evenly distributed. Pull out the roasted vegetables and add them to a blender or food processor. Once a puree forms add in milk and vegetable broth until it is a saucy texture. Pour the red pepper and butternut squash sauce into base of a 9×13 baking dish. Re-set oven to 350 degrees. 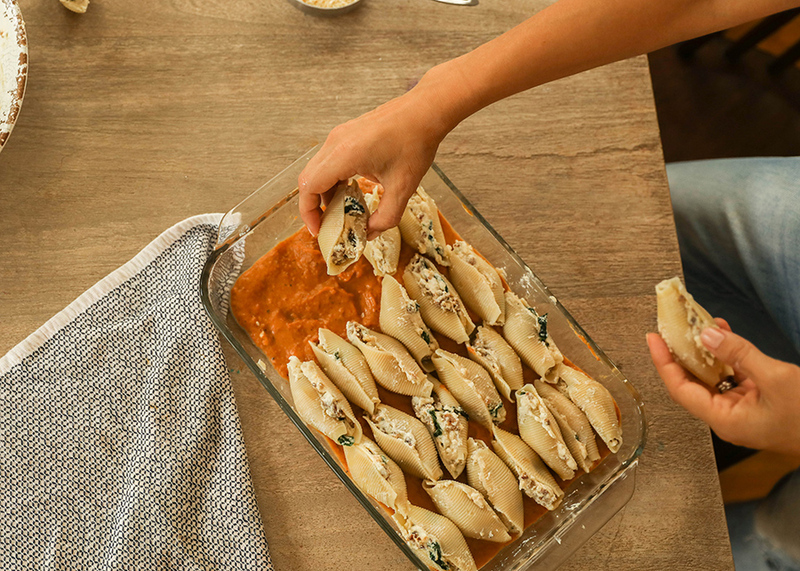 Once the shells have cooled, fill with a few tablespoons of the sausage ricotta mixture in each. 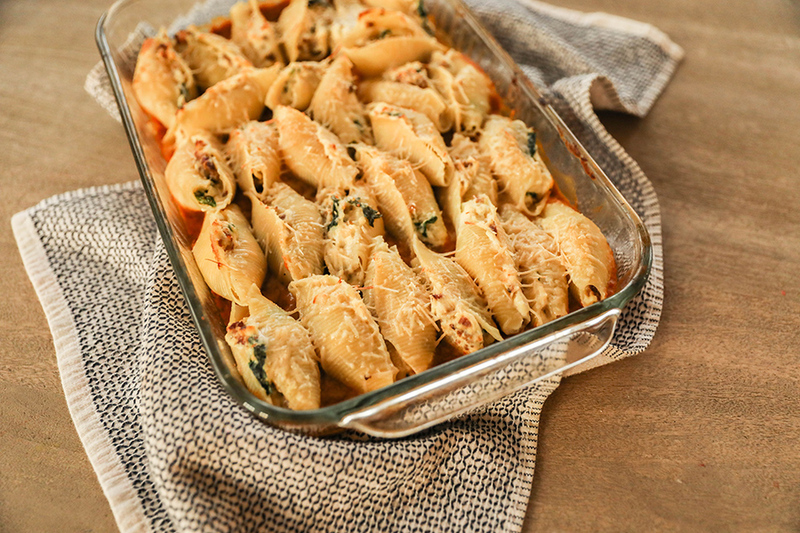 Place shells on top of the butternut squash sauce in the 9×13 baking dish in rows. Top with shredded parmesan and cover with foil. Stick in the oven for 30 – 40 minutes. Remove, and serve with a little more parmesan on top! Please let me know if you have any questions in the comments, and cheers to a restful Sunday! 3 medium red peppers (chopped) These can be optional! Boil and cook your shells as you chop your vegetables. Chop your peppers and onions and scatter across baking sheet along with the pre-chopped butternut squash. Pour over olive oil. Sprinkle salt and pepper. Use a wooden spoon to push around and flip to make sure it coats evenly. Stick in the oven for 45 min. Pull out the roasted vegetables and add them to a blender or food processor. Once a puree forms add in milk and vegetable broth until it is a saucy texture. Pour the red pepper and butternut squash sauce into base of a 9x13 baking dish. Re-set oven to 350 degrees. 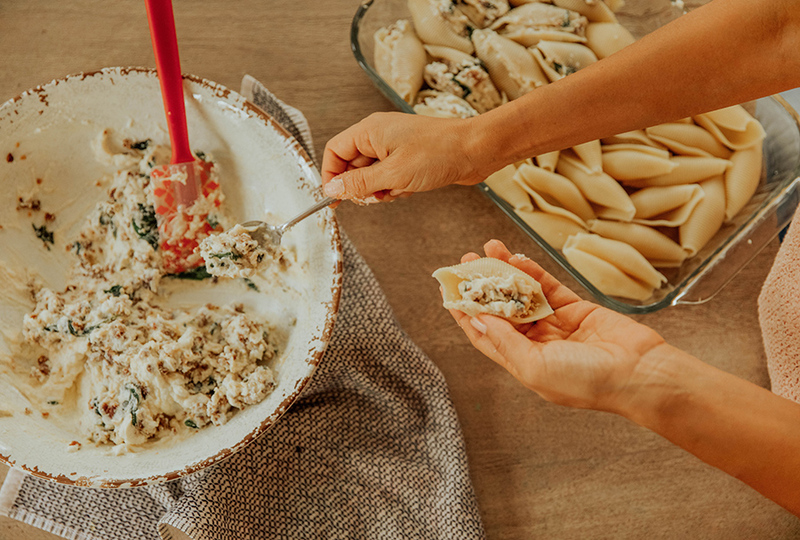 Once the shells have cooled, fill with a few tablespoons of the sausage ricotta mixture in each. 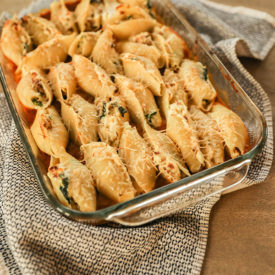 Place shells on top of the butternut squash sauce in the 9x13 baking dish in rows. Top with shredded parmesan and cover with foil. Stick in the oven for 30 - 40 minutes. Remove, and serve with a little more parmesan on top! Add your broth and milk a little at a time until you get the desired consistency. The images above show a thicker sauce, but after making it a few times I added more milk and broth to make it creamier! This looks so good! I’m going to try it soon. Although I will probably just go with a whole butternut squash, even though they are a pain to chop up! 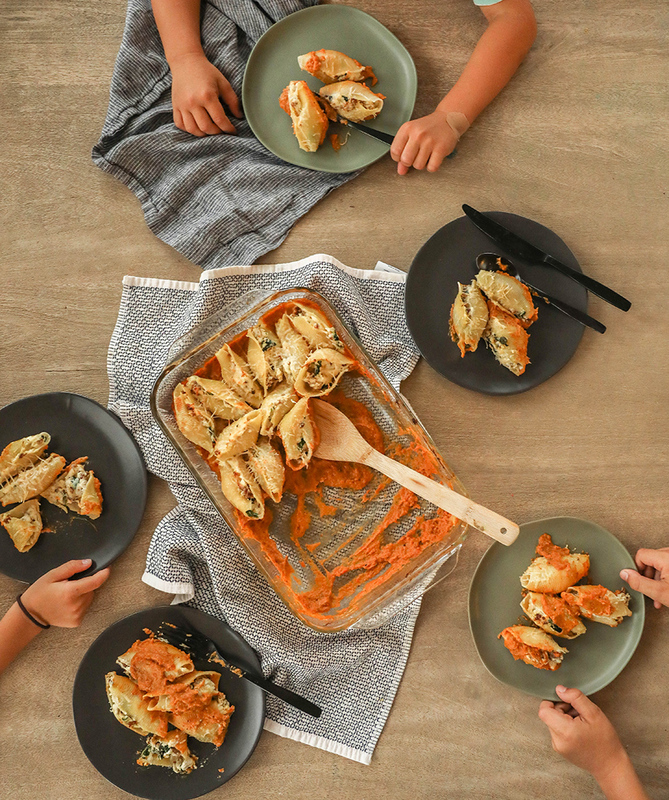 I also make a recipe that you shared years ago–Chicken Paprika. It’s always a big hit around here and a perfect winter meal with a green salad or steamed broccoli! Hope you are all doing well! I am so glad to hear that! It is still one of our favorite dishes here too. I hope you enjoy this one!